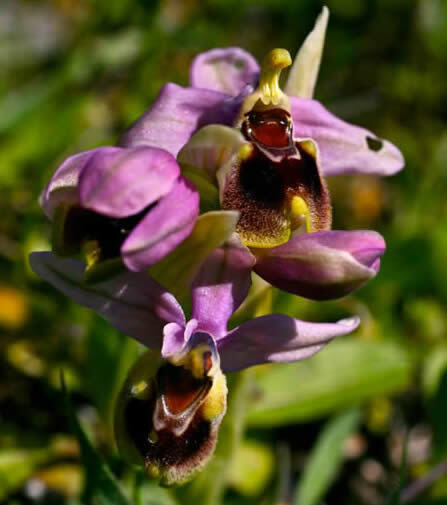 The Honeyguide website features a gallery of pictures of orchids in the Crete, and this web page is to give more information about these flowers. Here, we concentrate on orchids we see in April. The gallery itself is 20 pictures of 20 species, chosen from the bigger range we’ve seen over the years, and in all cases photographed on Honeyguide holidays on Crete. Many small pictures on this web page link directly to bigger pictures in the gallery – click on the pictures to see them enlarged on your screen. That’s not true for all pictures: this page includes some additional orchids that didn’t quite make it into the 20. Pyramidal orchid Anacamptis pyramidalis (Phil Brew); Pink butterfly orchid Orchis papilionacea (Chris Gibson) and a group of giant orchids Barlia robertiana. Like the man and loose-flowered orchids on the right, both seen near Spili, they didn't make the 'top 20'. 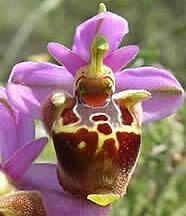 All told there are around 67 orchid species on Crete, according to the book Flowers of Crete. It’s not a precise number as views vary as to what’s a species or a sub-species, and some are doubtfully present. Here and in the gallery, we concentrate on orchids we see in April. 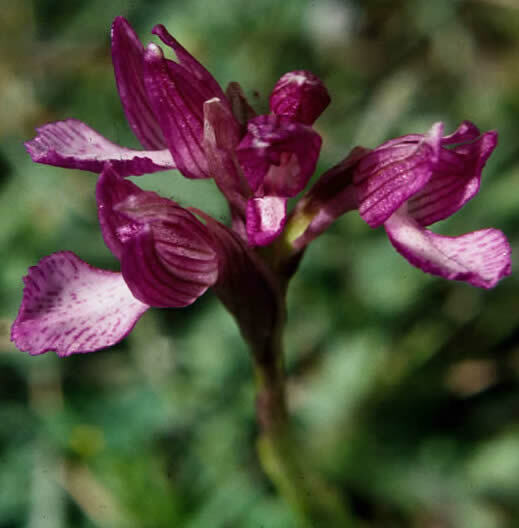 Orchid books like to show hybrids: our experience is that these are the exception and it’s best to concentrate on the ID challenge of species without that extra complication. Borys orchids Orchis boryi. The white one is simply a variant, and isn't a subspecies. Quite common above Spili. 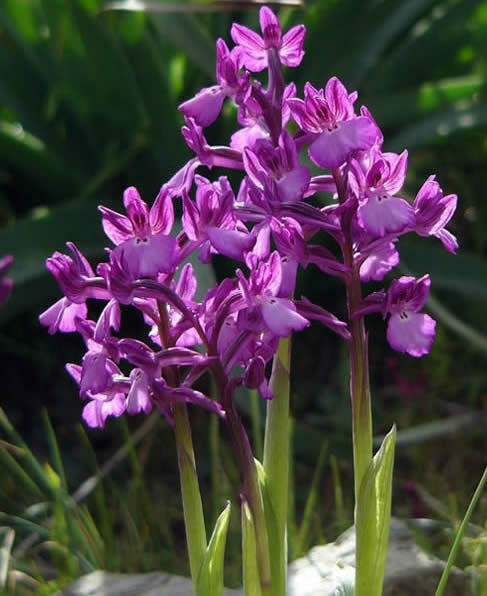 Every year is different for orchids, depending on winter rainfall, spring weather and other factors. 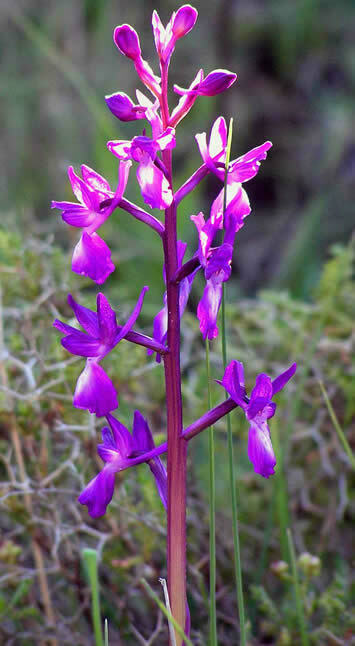 We choose April as it’s good for combination of orchids, other flowers and birds, both resident and migrants. Our dates have varied over the years, often influenced by when Easter falls. Though any time in the month is good, for Ophrys (bee orchid type) orchids, generally in early April there are more plants in flower and a bigger range of species. Later in April is better for birds and for flowers other than orchids. Ophrys sicula (left) and Ophrys phryganae (right). These two yellow bee-orchids (replacing true O. lutea on Crete) are tricky to separate. O. sicula is more delicate, with a thinner lip that lacks the downturn on the lip of O. phryganae. 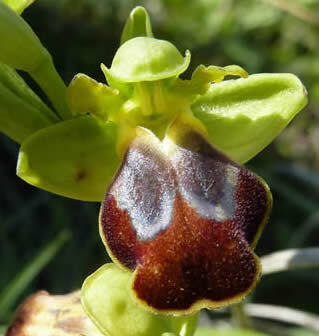 On the typically chunkier Ophrys phryganae, the lip rises into a lump as it disappears into the centre of the flower, the stigmatic cavity. The flowers are almost horizontal from the stem. Ophrys iricolor, Ophrys cressa and Ophrys creberima (left to right) are all in the Ophrys fusca sombre bee-orchid group. Ophrys iricolor, the rainbow orchid, is the showiest and most distinctive, with its iridescent lip, which is purplish on the underside, taking some dexterity to see! Ophrys cressa and Ophrys creberima are recent splits as species, so not in all books. The lobes on the latish-flowering Ophrys cressa are rather flat; on Ophrys creberima the lip is curved downwards. There is often a yellow edge to the downward-folded lips on both species. 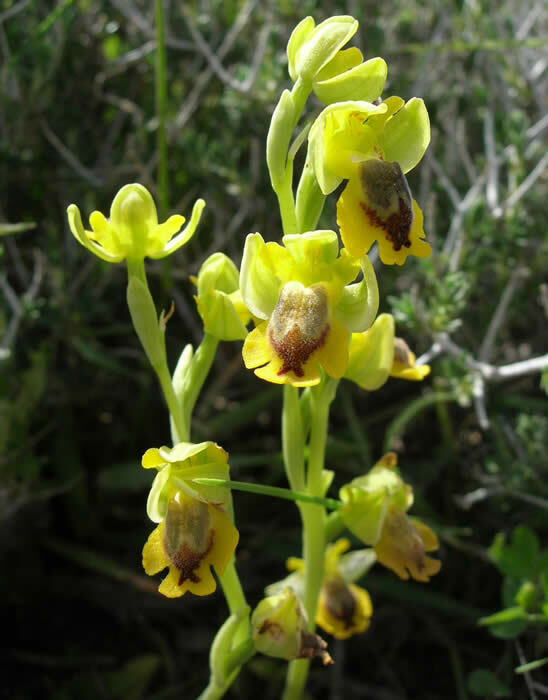 Sawfly orchid (above left, photo by Phil Brew) is found in much of southern Europe and familiar to many botanists, though it is now 'split' in the eastern Mediterranean as Ophrys villosa, meaning hairy, which it is, on the lip. Ophrys episcopalis (pictured centre and also in the right hand column) is sometimes ‘lumped’ with O. holoserica from elsewhere in SW Europe. 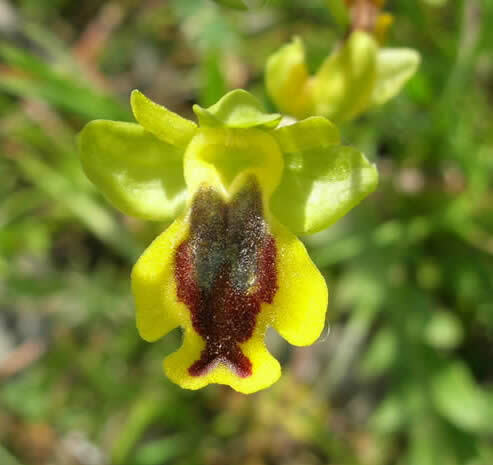 It is a similar shape to sawfly orchid but with a variable patterning reminiscent of the woodcock orchid group such as, on Crete, Ophrys heldreichii (right). Chunky, with a lip that’s square and downy, Ophrys episcopalis feels self-confident and with the purplish sepals the name bishop’s ophrys seems to suit it better than the alternative name of large-flowered bee orchid. 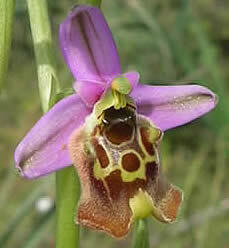 Ophrys heldreichii is sometimes known as marengo orchid. Chris Durdin, February 2012, with later updates. Photos on this web page by Chris Durdin, unless otherwise noted. All photos were taken on Honeyguide holidays on Crete in April. 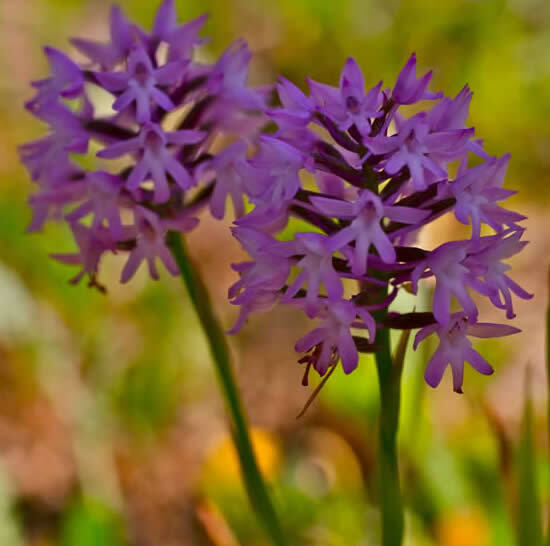 This web page is meant to be looked at alongside our Crete orchid gallery; for some, you can click through to gallery pictures. More flower books for Crete on this Flowers of Crete web page. 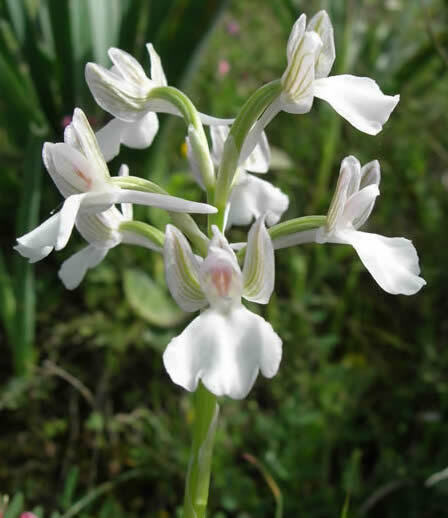 Orchis pauciflora or few-flowered orchid was considered a subspecies of Provence orchid Orchis provincialis. Careful study has led to many 'splits' of this kind. 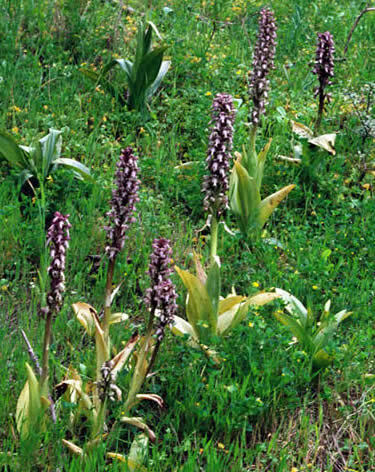 One of the commonest orchids on Crete, and with a long flowering period so seen by all groups. Ophrys episcopalis. Close-ups can give an incomplete impression. This is a particularly fine specimen, but shows how it can be quite a tall and robust species. Serapias parviflora (Chris Gibson). The tongue orchids are a notoriously tricky group.